Happy Easter everyone, hope you all have a great weekend with lots of time for crafting. I thought that I would show you another very simple card that will be taught in one of my upcoming workshops at Martells. First of all, I cut a matt from some Fancy Pants paper then a smaller one from Coconut white card. The white card was put over a mask and embossed in the Grand Calibur. I cut the flowers in the same paper using the Bitty Blossoms Spellbinder Dies and a couple of leaves from a Foliage set. The tag was cut from another Spellbinder set.. The next step was to make the flowers up which couldn't be easier using these dies. I do get asked quite often how to roll them and the answer is to start from the outside and roll in towards the centre. I always use a glue dot to hold them in place but Cosmic Shimmer Dries Clear Glue is brilliant for it as well. I stamped a message from a Sam Poole set of stamps...I think it was the "Art Sayings" set. If you haven't got this set yet I'd advise you to get hold of it. There are so many useful phrases in it. I know that Martells in Cliftonville stock this set of stamps (as well as lots of other Creative Expressions goodies!). 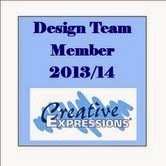 You can also see the set on the Creative Expressions website. The next step was to thread the ribbon through the tag and stick it onto the card. The flowers and leaves were the next to be added. Once the card was put together, I applied Cosmic Shimmer Gold glue to form faux pearls in the embossed flower background. It really is an easy card to make and I hope that the bright colour makes you all feel as though Spring can't be far away! Hope that some of you can make it to the demo on Wednesday...it would be great to see some friendly faces! There will be lots of Distress, masks, emboss folders, paint and mess!! Hope to be back tomorrow with another card. Sorry the details are a bit sketchy on some of these but I don't want to give the whole game away before I run the workshops!! Thanks for visiting and I do love to read any comments that are left for me.